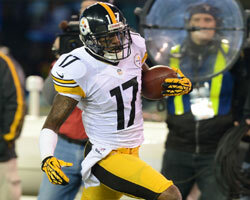 Mike Wallace, Cliff Avril to be overpaid in free agency? Published: March 8, 2013 at 02:43 p.m. Updated: March 11, 2013 at 08:47 a.m.
Around The League's Gregg Rosenthal already has highlighted the best values among this year's free-agent crop. Along the way, he noted that average starters often are paid like great ones, and good players get compensated like Hall of Famers. Let's take a look at those free agents likely to get overpaid in the next couple of weeks. Avril expects to hit the jackpot on the open market, perhaps drawing interest as an outside linebacker as well as a defensive end. For a player who has feasted on single coverage provided by a talented Lions' front four, Avril has yet to turn in a dominant season with more than 11 sacks. The Cleveland Browns and Indianapolis Colts appear to have their checkbooks holstered, ready to shell out upward of $10 million per year for Kruger after a dominant postseason run. It's fair to question if Kruger is more of a complementary piece than an impact addition, as he recorded just 1.5 sacks in six games before Terrell Suggs returned from injury last season. Wallace doesn't move the chains consistently, is not an efficient red-zone threat and has shown iffy hands. On the other hand, no receiver in the NFL has more receptions (27) or touchdowns (16) over 40 yards since the start of the 2009 season. Wallace deserves to cash in as a player who changes defensive coverages, but he's going to be overpaid when only Calvin Johnson and Larry Fitzgerald can top his contract. The Miami Dolphins and Minnesota Vikings are set to engage in a in a bidding war. Sharp route-running and reliable hands never go out of style, but Jennings is a "relief receiver" who will be a 30-year-old by Week 1 with a checkered injury history. Jennings is reported to be seeking anywhere from $11 million to $14 million per season, and the Vikings might get desperate if they miss out on Wallace. Smith is believed to be seeking at least $9 million per year, a fair number for a young, ascending player who graded out as the one of the league's best right tackles in 2012. It's also a risky number for a player who was viewed as an overweight, injury-prone bust two years ago. Will Smith's motivation wane once he lands a mega-contract? Viewed as the top cornerback available due to his size, physicality, age and glimpses of true No. 1 cornerback ability, Smith should have little trouble landing a contract in the range of $8 million per season. Just remember, no cornerback in the NFL surrendered more combined first downs and touchdowns last season. 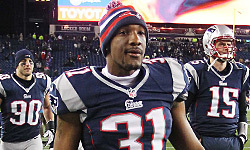 On talent alone, Talib has a strong argument as the top cornerback available. Even still, he's hardly on the periphery of the manufactured Sherman-Revis debate. Taking into account Talib's well-documented off-the-field issues and the risk of a lengthy suspension for his next infraction, he's going to be overpaid if multiple teams join the Patriots in the bidding. Although Cook has been a bit of tease the past few years, it's become obvious that he was under-utilized in former coordinator Chris Palmer's offense. As the tight end with the highest ceiling on the market, Cook already has at least seven suitors in addition to a Titans organization determined to keep him, even at a deep cost. It doesn't take an overactive imagination to see that his market will spiral out of control. Drew Brees' pocket movement and timing have masked Bushrod's deficiencies in pass protection the past few years. Bushrod tends to struggle against speed rushers, a weakness that will be exposed if he ends up landing big money from a tackle-needy team such as the Chicago Bears. The Jets are trying to find a way to re-sign Landry after a bounce-back season, but he's reportedly on the hunt for $6 million per year. Landry would be worthy of that contract if he could be counted on for 16 games, but his physical style exposes him to too many injuries. It's a troublesome sign that Cason struggled in coverage last season despite improved play from the Chargers' front seven. He's expected to target a contract worth at least $5 million per season. A strong blocker with intriguing athleticism, Walker can be used as a "movable chess piece" as more offenses veer toward multiple-TE sets. Let's not go crazy on his value, though. Walker showed brutal hands at times last season, and often was left all alone down the seam because Vernon Davis and Michael Crabtree were drawing double coverage. The dearth of quality wide receivers on the market is causing analysts to go ga-ga over a mediocre player who has been given every opportunity to emerge as a No. 1 or No. 2 option with the Rams. While Gibson came on strong at the end of the last season, he still was among the most mistake-prone players on the roster. SI.com's estimable Peter King ranks Gibson ahead of standout tackle Phil Loadholt and guard Louis Vasquez in his free-agent rankings. On a good team, Gibson is a third or fourth receiver.